Retirement Planning is one of the main aspects of Personal Financial Planning. Once you plan for your insurances (life / non-life), planning for your retirement should be your next high priority financial goal. With the break-up of the joint family system in India, increase in longevity (life expectancy) due to advanced medical innovations, shorter work-span and lower job security; ‘Retirement Planning’ assumes greater importance. HDFC Life Click 2 Retire plan is a newly launched ULIP based Retirement plan (pension plan). As per HDFC Life, this new online Unit Linked Plan offers market linked returns, with minimum charges and helps an investor to achieve Retirement goal by planning well in advance. 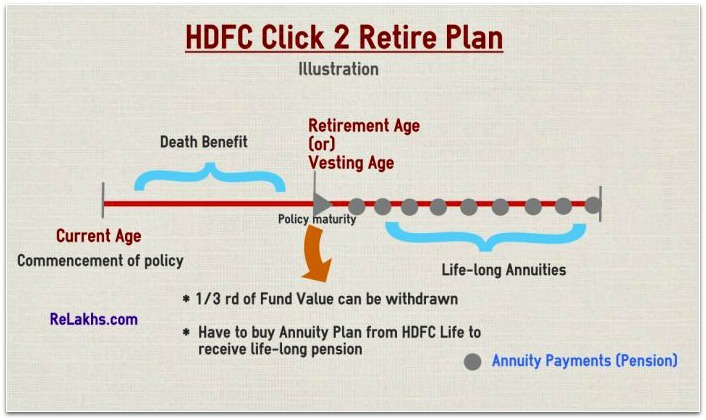 So, does HDFC Life’s Click 2 Retire is a good pension plan? Let’s discuss.. In this post let us understand – What is Retirement Planning? What are the key features of HDFC Click 2 Retire plan? How does HDFC’s Click2Retire plan work? Should you invest in HDFC Life Click 2 Retire online ULIP plan? Should you buy HDFC Click 2 Retire plan for your retirement? Accumulation phase – During this phase, you save and invest for your retirement. This is the stage where you invest to generate a decent corpus which is assumed to take care of you / your family during retirement. The earlier the accumulation period is in your life, the more advantages you will have (like the power of compounding). Transition to Retirement – This is an individual’s transition from work into retirement. Withdrawal phase / Wealth Consumption– In this phase, the retiree withdraws the income from the accumulated fund (Retirement fund / corpus) and enjoys the retired life. Click 2 Retire is an online Pension plan. For Single Pay the Policy tenure options are 10 or 15 to 35 years. For 8 years PPT, policy tenure can be 10 or 15 to 35 years. For 10 years PPT, policy tenure can be 10 or 15 to 35 years. Minimum Premium amount: Rs 24,000 p.a. Death Benefit: Nominee will get higher of the Fund Value of policy (at the time of policy holder’s death) or 105% of premiums paid till then. The vesting date can be deferred (postponed). You can postpone the vesting date any number of times subject to the maximum vesting age of 75 years, provided you are below an age of 55 years. On maturity, you can withdraw up to 1/3rd of Fund Value as commuted pension. As per current tax laws, this is considered as a tax-free income. For the balance amount, you have to buy an ‘ANNUITY PLAN’ from HDFC Life. Based on the then prevailing annuity rates, you will receive guaranteed regular pension for life. Surrender value: If you surrender after completion of the 5 years from commencement of the policy your fund value will be paid out. This plan does not offer any life cover; hence no mortality charges are applicable. No Premium Allocation Charges. 100% of your premiums are invested. Fund Management Charge : 1.35% p.a. of the Fund Value. Income Tax Benefits: Premiums paid towards HDFC’s Click 2 Retire plan can be claimed as tax deductions u/s 80c. Through the above calculations you can know the projected retirement corpus (based on assumed rate of return) and the premium that you have to pay. Do note that this plan provides you Limited Premium Payment Term options as discussed in the features. So, the policy term and PPT can be different. I have tried to explain how HDFC Click 2 Retire plan works with the below info-graphic. Based on your Fund selection (Equity / Income / Conservative), your fund value will grow during the policy term or accumulation phase. If you do not want to withdraw 1/3 rd amount, you can buy an Annuity plan from HDFC Life with the entire Fund Value that is accumulated on the policy maturity date (vesting date). You will then start receiving annuities during the withdrawal phase. The main issue with ULIPs is ‘Charges’. But Click2Retire plan’s claims that the charges are minimal. Since this is an online based plan, no intermediaries are involved, hence minimal charges are levied. Firstly, if you are looking for ‘Life insurance cover’ (Protection) then this plan is not for you. Instead, consider buying a best Term insurance plan . You should not invest in ULIPs or Retirement plan with a short-term view. To get better investment returns, the charges levied by the scheme or fund should be minimum and reasonable. If you compare the charges between ULIP scheme and mutual funds, ULIPs charges are generally on a higher side. In case, if your investment objective is long-term wealth accumulation and tax saving, you may buy ELSS Funds. 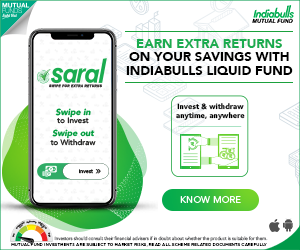 Do note that liquidity is very high in case of Mutual Funds. HDFC Life click 2 retire may provide guaranteed benefit on Vesting date. But, remember you are investing for long-term, you got to take risk and can not just invest based only on this premise. So, low annuity rates (pension rates) may not beat inflation. I personally believe that it is like you accumulate wealth and lose all the wealth to Annuity Plan Provider. Also, Annuity income is taxable (as per current tax laws) under the head ‘income from other sources’. Why do you want to receive an income which is chargeable to tax during your ‘retirement age’? Under HDFC Click 2 Retire plan you are forced to buy annuity at the time you retire, which may or may not be favorable to you . You are locked for life. There is no doubt that you need to plan for your retirement. But, you may do it with investment products which are more flexible, transparent, simple and easy to understand. If I have to invest for my Retirement, I will give it a miss. I hope you find this post informative. Do share your views on HDFC’s Click 2 Retire plan. Nearly was going to buy this until I came across this blog.The easy policy comparison expert had text me that 87000 perm pension would be received and we had a brief chat too but he didn’t mention about purchasing am annuity. So I think I shall not buy. Pension income is nothing but your Annuities. I want to make an good investment for my regular income which is planed from after 10-15 years. what will be the best NRI investment i can do . also after 3-5 years if i became an normal resident in India due to job crises what can impact on NRI investment. May be you can consider Equity mutual funds. 1- I’m planning to buy term plan (HDFC click 2 protect) 50 Lakh cover with critical illness, permanent disability, Is this plan is good? 2- I’m planning to buy retirement plan also, could you pls suggest me good retirement plan? Any term plan should be ok, if it meets your requirements. Claim settlement (if any) would not be an issue, if all the required info is provided in Proposal form honestly. Kindly read : Best online term insurance plans. Retirement goal planning & calculator. Excellent and very informative article. My request to you to write an article on Child education fund generation stratagies. Kindly read : Calculate how much you require for your Kid’s higher education goal ?? very informative and useful advice ,as per your opinion and my , i have conclusion that it is better to buy mutual fund instead of any retirement plan because they are not grow with inflation ratio and resulted that we will be suffered for whole for taking this wrong decision. Yes, Equity mutual funds can be a better option for long-term goals like Retirement planning. If you have expertise to pick the right stocks at the right time, direct equities can also a good investment avenue. List of best investment options. Retirement planning goal and calculator. please review on hdfc click to invest ulip plan. Dear bapaiah..will surely try..thank you for the suggestion. thank you very much. i hope u will await for review on hdfc click to invest and similar comparison plans . Dear Vipul..I am not sure if you have the read above article completely or not. Writing an article on ULIPs is not a wrong thing! Even my viewpoint is in favor of mutual funds. Kindly go through the points given in ‘my opinion’ section. Hi Sreekanth, I am sorry if i have offended you , but the intention was not to offend you. Its my pleasure to have you (who has high regards for readers) as my blog visitor. Let’s say XYZ company launches a traditional plan like Endowment plan which gives around 5% returns on maturity. Don’t you think we as bloggers have similar social responsibility to highlight the pros & cons of a low-yielding product which may not be suitable for many of us after considering the high inflation (in a growing economy like ours)?? So, I believe that it all depends on how we present the data/content. 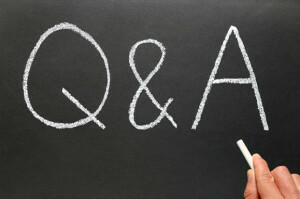 I am confident that my blog readers will understand & analyze my posts and take right financial decisions. In case if they have queries on these kind of products, I am also approachable/ready to reply to their queries & assist them. Cheers! Which is the best Retirement pension plan with good monthly returns? Dear Noor..Suggest you to avoid buying pension plans offered by life insurance companies. Instead suggest you to build your own portfolio ex: mis of equity mutual funds or shares + PPF/EPF etc., to accumulate your retirement corpus. Read : Retirement planning calculator. Nice article and like your point of view and the way u have articulated. Very informative sreenanth! Awesome Explanation, thank you so much for the article..
Dear Brahma..Let them force but let’s not buy if they (products) do not meet our investment objective or requirements. As an investor, we need to be aware and beware! Don’t you think this plan is replica of NPS? Good point Sanyam..The basic structure of this product is similar to NPS. As always, your this article too is very informative.I never try to miss ur articles as they are impartial and unbiased and focusses on the individual investor. However would like to know, being at my age( 49 years), will it be advisable to invest in equity based MFs as equity fund would be risky. Considering a retirement investment for 10 years, I don’t know if debt fund would be a good idea. Any other thought in your mind ? Apart from this, do u suggest me to invest in stocks (at this age) ? Kindly let me know about your existing investment portfolio meant for your Retirement goal.